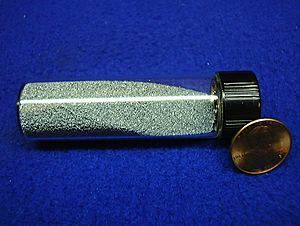 Granules of tungsten in a glass vial. Tungsten (sometimes named wolfram) is a chemical element. It has the chemical symbol W. It has the atomic number 74. It is a metal. The colour of the metal is steel-gray to white. In chemistry it is placed in a group of metal elements named the transition metals. Tungsten is found in several ores. Two ores which have tungsten in them are wolframite and scheelite. Tungsten has a higher melting point than any other non-alloy that exists. The pure form (only tungsten) is mainly used for electrical uses. Its compounds and alloys are used for many things. Their most well known use is in light bulb filaments. It is also used as the filament and target in most X-ray tubes and also in superalloys. It is also used in glass to metal seals. Tungsten's dense nature has been used for many things. In the military, for example, Tungsten has been used for building howitzer shells. Tungsten mining in Rwanda forms an important part of the country's economy. Tungsten Facts for Kids. Kiddle Encyclopedia.